I've put in an objection to yet another set of plans where a developer has thoughtlessly put a cycle track across a T junction in a way that has contributed to many injuries and even a few deaths across the country. West Norfolk is littered with this failed layout, so I want to explain how it's broken, what's better and what would be good, with illustrations. So let's say we have a road. Let's say this road has cycle tracks along both sides (rare but let's dream). Now, let's say this major road has a minor road meeting it at a give-way T junction, which has its own cycle tracks. How should people cycle across the minor road? So, you're on a bicycle at the red arrow, continuing straight ahead along the red dotted line. 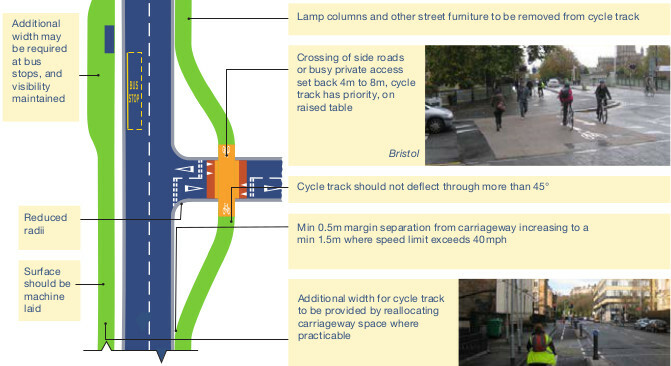 The designers expect you to give way and the cycle track is marked as such. Where do you look? Vehicles can come from any of the directions indicated by blue arrows, a spread of over 180 degrees. Even slowed right down as much as you can without wobbling, you can't cover all that in one glance and by the time you've turned your head to one extreme, a vehicle at the other extreme may have changed direction onto a collision course... maybe if you're an owl that can spin your head 270 degrees without moving your body, you could do it! I feel that the main reason these junctions haven't killed more is because most people are kind and don't want to collide with each other, so will give way if in any doubt, but people have been seriously injured (including by King's Lynn railway station) and even killed (not in West Norfolk yet) on this type of layout. They are truly lethal. There is a tactic that minimises the risk (I'll explain on another page), but it's cumbersome, counter-intuitive, not totally safe and the penalty for its failure can be serious injury. To be safe, you have to come to a full stop and wait for no vehicle to be within striking distance (literally) of the junction, which can be a very long time on busy roads. Of course, this does not encourage cycling and therefore, it's contrary to a ton of national, county and borough policies. Why are these lethal junk-tions still allowed by planners??? So that's how not to design a cycle track that continues past a T junction. What should they do instead? In essence, the cycle track gently curves away from the major road and has a crossroads with the minor road set back 4m or more. Cyclists and motorists cross at right angles and there's little doubt about whether they're turning into the minor road. Everyone can see everyone easily and cyclists get a level crossing. We have only a few of these around West Norfolk and they're much better. 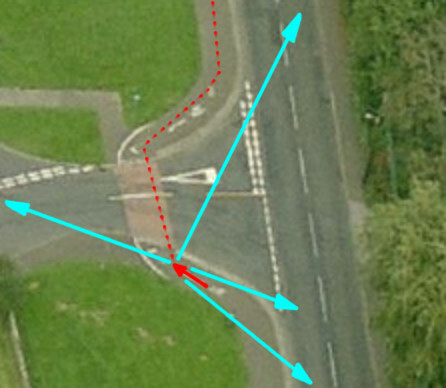 It's equally important that the corner radii are reduced, so that turning motorists have to slow down, which gives them time to check the cycle crossing before entering it and gives cyclists more time to see them if a motorist fails to stop. Now if you're approaching at that red arrow and continuing along the red dots, you need to check over both shoulders (because cars can turn quickly) while you're turning! Defeat has been snatched from the jaws of victory, apparently because the cycle track wasn't allowed to split a piece of grass (and there would have been more grass if the corners were tighter!) - a piece of grass where you can see a faint line trodden across it to cut the bottom-left corner anyway. 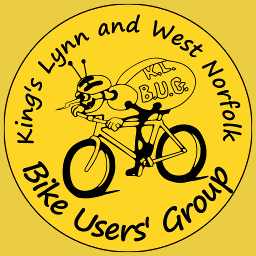 If you ever wondered why KLWNBUG's rides mostly use Nursery Lane in South Wootton instead of the cycle track, this nasty junction with Meadow Road is part of the reason. Don't cherry-pick one element: use the whole design whenever possible. 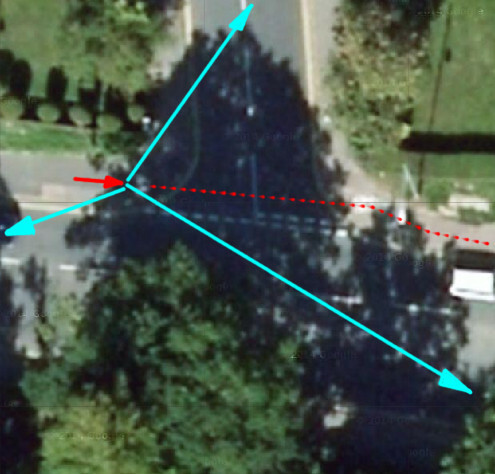 Sometimes, it's argued that there's not enough space for the 4m set back or the approach curves, although this does not often apply to new developments unless there's a drain or pylon very close (but then should a new T junction be so close?). However, Sustrans includes the second-best way to deal with this, too: put the give-way lines behind a coloured and raised cycle track. So even if you're sticking really conservatively to the UK regulations that really need updating (and updates are underway), there are plenty of ways to put a cycle track across a minor road without endangering its users. Thank you for reading this far: let's stop allowing junk-tions and start having safer junctions! But remember this is only one element of space4cycling - often, one of the other methods will be better than building a cycle track where there's lots of junctions or constrained space. More seriously, for your examples, if you put in give ways on the bike tracks then as a planner, you can do what you like with the rest of the geometry, because it puts responsibility on the rider to make the decisions - experience, convenience or no - and not the all-important motorist (who obviously "can't be expected" to consistently give way to bicycles or pedestrians). But in my example, not as important as the highways legal team. PS Nice article and junk-tions is a great coinage!